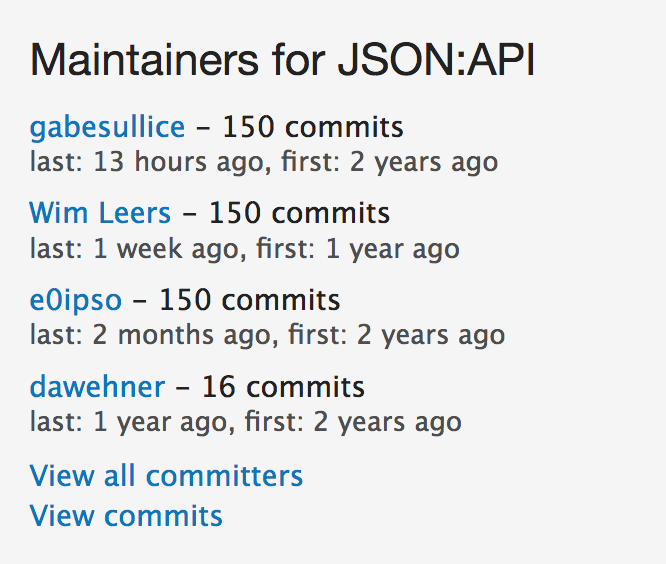 JSON:API committer statistics showing that the three main maintainers each have 150 commits! The screenshot Mateu shared a month ago. Showing Wim at 149 commits, Gabe at 147, Mateu at 150. Gabe, Mateu and I just released the second RC of JSON:API 2, so time for an update! The last update is from a month ago. The file uploads feature: 80% → 100%, will ship in 2.1! The revisions feature 3: 80% → 90%, will ship in 2.2! Renamed from JSON API to JSON:API, matching recent spec changes. JSON:API responses were no longer being cached by Page Cache. This was of course a major performance regression. Fortunately long-time Drupalist yobottehg discovered this! Massive performance increase for requests using sparse fieldsets such as ?fields[node--article]=title. Thanks to long-time Drupalist jibran doing quite a bit of profiling on JSON:API, something which Mateu, Gabe and I haven’t gotten around to yet. Moving 2 lines of code made his particular use case 90% faster! We’re sure there’s more low-hanging fruit, but this one was so tasty and so low-risk that we decided to commit it despite being in RC. So … now is the time to update to 2.0-RC2! 11:09:05 <e0ipso> COMEON gabesullice you're slacking!